The Layout and Features are Geared to Making Life Easy for the Angler with Plenty of In-Deck Fish Box Holds, Loads of Storage, Large Built-in Bait Tank, plus Built-in Bait Prep & Sink, Rocket Launchers, Rod Holders, Rod Storage, Cockpit Combing, Remote Windless Anchoring, Hardtop, Outriggers, Small Mid-Cabin Sleeper, Large V-Berth Plus Sharp Entry/Wide Beam Stabilty and Cruising Speeds in the Range of 30 Knots to get you Where You Want to Go, Fast. 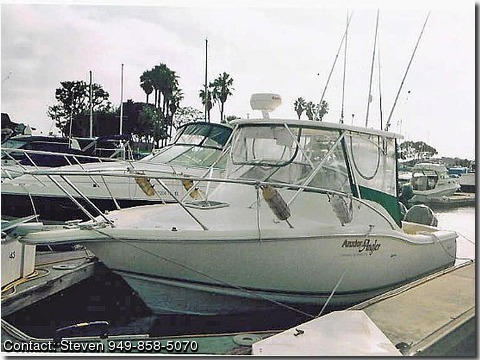 This Owner did a First Class Job Outfitting and Maintaining the Boat with a Sealand VacuFlush Head & Holding Tank, Hot and Cold Pressure Water with Shower, 1000 Watt Inverter, Good Electronics (Best Available when Built-Color Sounder and Radar), Nice Sound System, Galvanic Isolator plus Proven Yamaha Outboard Work Horses (Super Clean Twin 2-Strokes with 425 Hours-Show Like New). Scout out this Rare West Coast Option before you consider your Sportfishing Boat Purchase.